Happy Mothers Day! Hope everyone had a good Sunday! 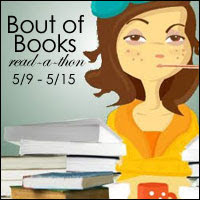 In a few hours, we will be starting the week long Bout of Books 16 read-a-thon. Like previous thons, I will only be reading and will not be participating in any of the challenges or anything. And of course, like previous thons, my reading list decided to go for a change. Of course. What I had planned on reading prior to the Bout of Books week ended up changing; what I decided to start reading during the Bout of Books week also changed. So I won't be surprised if I end up changing my list of Read-a-thon Hopefuls below either. At this point, anything could happen. I am currently starting Suzanne Brockmann's Prince Joe, but haven't gotten far into it yet, but I suspect I'll have it finished within the next couple of days.